› Author AffiliationsItalian Ministry of University and Research (MIUR) through the Scientific Independence of Young Researchers (SIR) program (‘HOT-SPOT’ project, personal research grant no. RBSI14A7PL to S.M. ), Ramón Areces Foundation (A.M.G.’s fellowship), and Beneficentia Stiftung Fundation. Dipeptides and their cyclized 2,5-piperazinedione (or diketopiperazine, DKP) derivatives are attractive building blocks for supra­molecular hydrogels. The Phe-Phe, (p-nitro)-Phe-Phe, and Phe-Val dipeptides and their corresponding DKPs are studied for self-assembly in water. 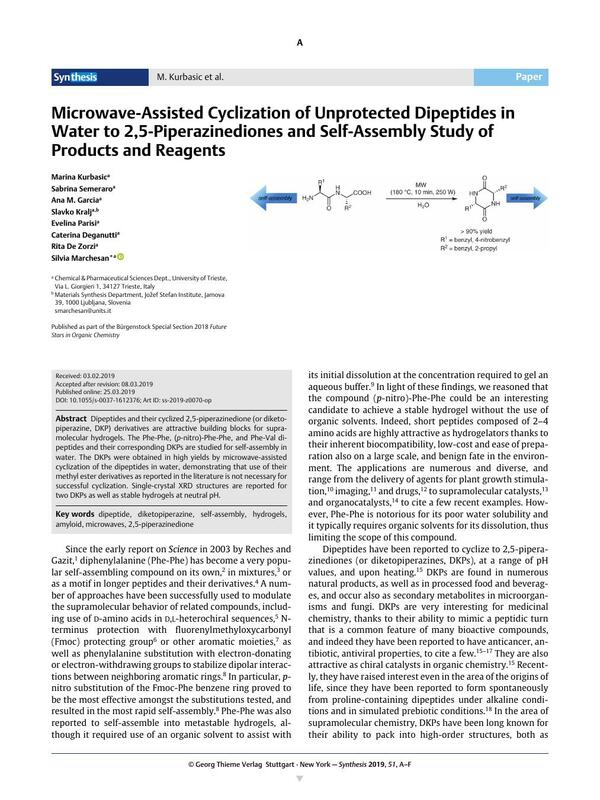 The DKPs were obtained in high yields by microwave-assisted cyclization­ of the dipeptides in water, demonstrating that use of their methyl ester derivatives as reported in the literature is not necessary for successful cyclization. Single-crystal XRD structures are reported for two DKPs as well as stable hydrogels at neutral pH. Supporting information for this article is available online at https://doi.org/10.1055/s-0037-1612376. 35 CCDC 1895316 (DKP1) and 1895262 (DKP2) contain the supplementary crystallographic data for this paper. The data can be obtained free of charge from The Cambridge Crystallographic Data Centre via www.ccdc.cam.ac.uk/getstructures.